The last week was a “work hard” kind of affair and both before and after I’ve had my share of writer’s block. That doesn’t mean I’ve stopped eating. 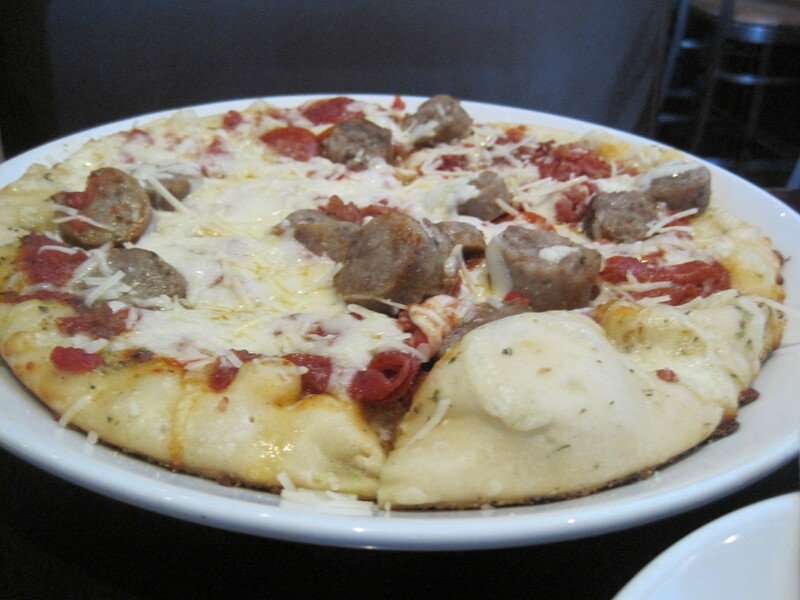 Below is a photo of the “Hold the Veggies” pizza at Gary’s Bistro. Food notes and restaurants revisited – Fini’s Pizzeria, Lawrenceville GA and Haru Ichiban, Duluth GA.
My wife has taken a fancy to Fini’s Sicilian style pizzas and we’ve been there twice in recent days.This preference, of course, is expressing itself right in the height of the Antico pizza craze. Fini’s is just world’s closer, and it’s a place the family knows. Drive to Highway 29, head up Lawrenceville Highway to Lawrenceville-Suwanee Road, turn left and eventually, Fini’s is on your right. Couldn’t be simpler. Fini's Sicilian slice. Crisp bottom, chewy crust, and delicious. chirashi sushi from Haru Ichiban. By the time our fish dishes were on the table, the salmon was gone, to be replaced with pike mackerel and my dish was given to my mother-in-law. We were half way through the fish before either of us noticed. We must have been hungry. I got a piece of the miso cod before it completely went away and it was the best thing I had that day, melt in your mouth tender, miso flavor permeating the fish. The pike was good, though the white flesh along the back and sides was the best part of the animal. nabekayi udon, in an iron pot. grilled pike mackerel, or pacific saury; sanma in Japanese, kongchi in Korean. I dropped by Buford Highway Farmer’s Market recently to look for Sichuan peppercorns and found, to my surprise, green mangos. I tried to call my wife but that didn’t work. I went ahead and bought a few. I knew she’d find a use for them. As for the Sichuan peppercorns, it looks as if they call them “red pepper corn” in BHFM, and they are currently on the lowest shelf in the Chinese section of the market, reasonably near the black and white peppers. So a question: I bought a pepper mill, to grind the Sichuan peppercorns. Is that how this spice is used? Green mangos and Sichuan peppercorns. My copy of “Izakaya: the Japanese Pub Cookbook” has arrived. I’ve only had a chance to glance at it, not really read it thoroughly. The izakaya scene in Japan, and for that matter, in Los Angeles (also here) and New York, is remarkably diverse and trying to categorise the izakaya as a single thing or a single model, as some people have done, is a bit like saying there can only be one kind of pub. When the izakaya can go from vast commercial chains to three story Western influenced institutions to settings hardly more robust than a roadside stand, hardly anything epitomizes the izakaya “model”. I think the spirit of an izakaya can be captured, though, and thinking about it, I’m guessing that’s what Bill Addison meant in his recent Atlanta magazine review of Shoya. The spirit of the izakaya is what Mark Robinson is trying to illuminate in his tour guide of saki house foods. I ran into it first at New Orleans, the People’s Restaurant and it’s been a preoccupation ever since. It took a while to realize the sweetness was coming from the collard greens, because any greens I’ve had prior to that experience didn’t have a bit of sweet at all. And I paid attention to greens back in the day, because I first encountered them in school lunches, and really liked them, thinking they were a better spinach. It took a while for me to stop telling my mom about how much better the spinach was at school, compared to the spinach we got from the can. I’ve asked people at work about sugar in greens and two ladies I know say their grandparents do it. Since we can find extant recipes of this practice, it’s hardly dead. My understanding was the Southern way was to add some meat and fat (fatback, bacon, ham hocks, turkey neck bones, etc) to the greens while cooking, and now we have this interesting variant. Recipes where collard greens are sweetened (or readers suggested sweetening) can be found here, here, here, here, here and here. Is Hot Wok gone for good? Chow Down Atlanta’s recent review of Blue Fin Sushi (a resurrected Sakana Ya) has me wondering about the fate of one other restaurant in Friday’s Plaza on Peachtree Industrial. Does anyone know what is going to happen to the people who ran/cooked for Hot Wok? This was a Chinese eatery that served Chinese food in a style than Indians prefer, a product of the fusion of cuisines when Chinese live in India. Are they going to relocate as well? It was unique enough that out of town guests would ask us to take them there. They liked it quite a bit, as I recall. I’ve eaten in Naples. From the ancient, brutally hot ovens emerge pies that most Americans wouldn’t recognize. The crust is charred and puffy in spots but tragically thin and pale beneath the toppings. The sauce is chiefly chopped tomatoes, sometimes fresh and sometimes canned, but almost always vivid and bright. (Those San Marzano tomatoes are as good as advertised.) The cheese is mozzarella, but the Italians are proudest when they can substitute fresh mozzarella from the milk of buffaloes and label their pies Margherita DOC. (It sounds like a wine thing, but it’s also a pizza thing.) In my opinion, buffalo mozzarella is pizza’s second-worst topping, exceeded only by whole anchovies—no hot, smelly fish on my pies, thank you. After that, those pizzaioli guys add oil, lots of it, and more liquid is precisely what tomato pies do not need. This is what happens when a Neapolitan pie comes out of the oven, after it’s been cooked a remarkably short time: The nearly liquefied glob of buffalo mozzarella—now resembling a snowman melting on a warm March afternoon—has become runny. Water drains from the tomatoes. Oil joins the flood. All that excess liquid has to go somewhere, which is why the bottom crust turns to mush, not that it was ever particularly crispy. Alan, for what it’s worth, has his own blog. This was an apple tart at Gourmandises. Every time I show up at this small bakery and restaurant, I end up impressed by the way Jennifer Allen and Christophe Houy handle themselves and their customers. True pros, and they are a pleasure to watch do business. If you have a day off, you could do far worse than heading out to Suwanee to visit this fine eatery. I’ve been taking photos of my boonies, and this is one of my latest shots. If people can’t figure out that these simply aren’t Thai ornamental peppers, then they must be blind. Just to emphasize, let’s take a picture of a single leaf beside my hand. How could this be a plant that is 12 to 18 inches high? How can the Wikipedia be so silly as to promote the notion that Marianas boonie peppers and the Thai ornamental are the same? I, too, read in early August Michael Pollan’s article “Out of the Kitchen, Onto the Couch”. The thing that touched me most, though, was the quality of his writing. When he spoke of Julia Child’s voice, he just cracked me up. …Julia’s voice was like nothing I ever heard before or would hear again until Monty Python came to America: vaguely European, breathy and singsongy, and weirdly suggestive of a man doing a falsetto impression of a woman. and this kind of writing peppers the whole article. My wife loves a good movie and when she goes to the movies, she gets a heaping tub of popcorn, a big drink, and that’s it. During the course of a day I need a bit more food than that at dinner, and the place we have been going for that before movie pick-me-up or an after-the-movie snack is Fazoli’s. Fazoli’s serves Italian food at a very affordable price. It doesn’t hurt at all that it is close to the Carmike Cinema, and while convenience is a large part of the reason for eating there, price and taste are good reasons as well. There is little on this menu I don’t like, and it’s easy to put together a meal for much less than 10 dollars. If I don’t want much to eat, I’ll get one of the pastas, and if I’m at all curious I’ll try one of Fazoli’s samplers. You get bread sticks with the meal as well. Il Forno is on the corner of Five Forks and Oak Road, just a block from the Five Forks – Ronald Reagan intersection. It used to be part of a chain, but was bought out by local ownership. I had eaten there a lot when it was part of the chain, but almost never since. When it was a chain, it delivered a surprisingly good pizza pie for a Southern corner shop. And I had been growing increasingly curious if the new ownership had found out how to consistently make a good crust. The inside of the restaurant is attractive. The countertop is a steel surface and the chairs and tables are nice. There aren’t very many of them. I counted 7 tables inside. They do have outside seating, however, and when the weather is mild they can handle more people. The waitress and the cooks (visible as you sit) were all wearing I Love New York shirts and/or hats. A black T shirt was the uniform of choice. I looked for something with pepperoni and some Italian sausage, and the only thing on the menu that fit was the Cardiology special. I ordered a 12″ pie and a beer. The on-tap beer selection is quite good if you’re into the heavier ales: Anchor Steam, Sierra Nevada, Pilsner Urquell, Brooklyn Ale, etc. The pie took a little time, and I was on my second beer when it arrived. It’s a thin crust pizza, and given the lightness of the crust, it had a respectable set of toppings on it. I could see that the crust was browned on the edges, but the take home lesson would be in the center of the pie. I’ve spent a couple years in the Northeast, and the one thing you can count on in a Pennsylvania or New York pie is a crispy crust. And in a joint claiming a New York heritage, don’t even bother if the crust isn’t good. I pulled out a slice, took a bite. It was crisp from tip to tail. In all honesty I was a bit relieved. You always hope a place this nice looking will put up food to match its looks and it did. Now I will warn people that the thin crust doesn’t stay crispy terribly long. In my estimation this is a pie to be eaten on the premises, and not taken home. Before I was finished the toppings were steaming the crust in the middle and the interior inch or two had lost its crispiness. Of course, there was just one of me and a 12″ pie to navigate. Served to 2 or 3 people, this pie would be just fine. I didn’t order salads or calzones as I was there, but I saw them made and pass by. The calzones are simply enormous. The salads looked good, but they also looked a lot like they were assembled from precut pizza toppings. The base (sauce and cheese) 12″ pizza runs about $11.00. The 16″ runs about $12.50. Toppings run from a dollar each to $3.00 for chicken. Named pizzas range from $13-$17 in the 12″ size and $14-$20 in the 16″ size. Pasta dishes run from $8.00 to $14.00, but most under $11.00. Calzones and Strombolis range from $6-$9.